Mark Twain once said "I've never wished a man dead, but I have read some obituaries with great pleasure." It is in that same venue that I write today. It is an odd feeling isn't it?? Being glad. Rejoicing over someone's death. Last night, my husband, my seventeen year old and I sat riveted to the television breathing in each word that our President intelligently and gracefully, firmly let flow. My initial reaction was to clap. To cheer. To dance a jig right there in our bedroom. To help organize a parade or a national holiday. We let out a "whoop!" Jeff and I high-fived each other and I exclaimed, over and over "Obama got Osama! Obama got Osama!" Then I noticed, my 17 year old out of the corner of his eye sizing up our reactions, and I was ashamed. I was sheepish. Aren't I supposed to be setting an example. I definitely wasn't doing a good job, was I? And so I quelled my response. I subdued my feelings of elation, and rationally began the process of parental thinking. How must this look to my son? After all, he was a mere 7 when Bin Ladin's horrific murderous rant occured. He is of course aware of the tragedy. Several times we've taken our boys to the site, to remember, to give them a sense of history--of patriotism. But still, to him, it was something that happened once upon a time. Could he possibly grasp the notion that on the rarest of rare occasion it is more than just all right to take refuge and solace, heck to celebrate like Hell, the demise of evil. Or was it? My feelings on the topic are definitely...well...dare I say...MUDDLED. 1. Patriotism: Watching the throngs of people gather outside the gates of the White House, hearing them sing the National Anthem, listening to the boisterous chants of U.S.A! U.S.A! gives parents a golden opportunity on a silver platter. Those images are a sure fire way to teach your children that no matter who we are, what we believe in, or where we stand on issues--we are one country. We are a country of people who, when the going gets tough, unite to sing the praises of our similarities. Our commonalities that we believe in, we love and we will fight for our beloved America and its citizens. 2. Empathy: Let's face it the world is wide but it is a rare child whose viewpoint isn't narrow--based purely on a lack of chances they get to experience that there are others...others who make up the fabric of human kind. Here is a chance for us to teach our daughters and sons that this man's death provides us an opportunity to think about, to consider the thousands and thousands of family members who had their loved ones stolen from them some ten years ago. It is a chance for us to help our kids "put themselves in someone else's shoes." Even the youngest of minds can imagine what it would be like to not have a daddy or mommy. Teaching our children the art of understanding, the art of TRULY feeling for their fellow humans is an invaluable tool if we ever want to move towards a more utopic society. Talking about, praying for, remembering those Americans who suffered the loss of someone they loved because of Bin Ladin's evil would be a great place to start. 3. Perseverance Pays Injustice and evil are inevitable parts of life. Learning this the hard way is an unfortunate part of growing up. I say, that this life loop hole shouldn't come as surprise to children. Bad things happen. I think that it is okay, even necessary, to help our sons and daughters develop an awareness of that as soon as they can. Part of that teaching, especially in the context of THIS conversation, should be that quite often perseverance and patience will pay off in the long run, and can combat the forces of evil. In this case it was our brave soldiers and the extraordinary brains of many who over the course of 8 months planned and replanned and gathered intelligence in order to someday reach their goal. 4. Hatred Ultimately Destroys It's Host George Washington Carver once said that hatred eventually destroys the hater. Never has there been a clearer example of this quote than Osama bin Ladin. The measures that the man took to destroy those that were the objects of his hatred eventually led to his demise. As parents, this moment in history is as good as any to teach our littlest family members that love gets so much more accomplished than hate. That treating others...ALL others...with dignity and respect should be a daily affirmation because it is right and good not only for the person receiving the kindness but for the giver. 5. Dialogue=Intelligence In light of bin Ladin's death there is bound to be an upswing in those horrific images of 9/11. It is impossible to shield our children from all those violent images. So use it for good. Teach them of the great orators and peaceable humans throughout history. Martin Luther King, Ghandi, Susan B. Anthony are fantastic personalities that we should use to counteract the idea that violent aggression and war are the ways to get things done. We could even practice the art of polite negotiation at home. "Mom, I want a cookie." "Well dear it is 10 minutes until dinner. You can have some cucumbers." "Mom, I am not in the mood for cucumbers. Can I have cheese?" The most important message we as parents should emphasize to our children no matter the age is that the grown-ups in their various roles are in charge and that they are safe. No, we can't REALLY say that with 100% certainty, but children are about absolutes, about black and white, about right and wrong. Remember when life was that simple? Remember when fairy tales endings were not only possibilities, but the norm? Although that feeling is a rarity in adulthood, yesterday we were reminded what it was like when the dragon is slayed and the princess saved. We were reminded of witches dying because of flying houses, of evil wizards being defeated, of a magical ring finding it's rightful place. Yesterday, the good guys won and the bad guys lost. Yesterday was a good day. Great post. One of my friends mentioned to me last night that she could not rejoice over the death of a human being and it really made me think a lot on the matter. Another friend quoted Matthew 5:44. Are we bad people to enjoy seeing justice served? An eye for an eye and all that? 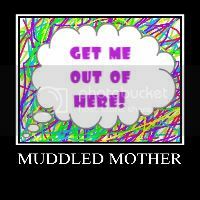 I'm muddled as well. I don't believe any person has the right to take the life of another. I don't rejoice in the loss of another human being. I am grateful for the peace his passing may bring to the thousands of people whose families he destroyed. You were right. He was the author of his own demise. He could have answered for his crimes. Rather he decided to die. Nothing can bring his victims back but we can rest assured he won't be able to take another life. Thank you for helping us all to process how we are handling this and the ways we can communicate with our children. Nice article! May we all find peace in our hearts. I disagree with a lot that you have written, but.. I think we all do the best we can regardless. AND I think that as long as we mom's/dad's TALK to our kids and explain our 'muddled-ness' and our confusion than that is one step in the right direction. I had the exact same feelings as you. This topic is so diverse in so many arenas. I do like reading and listening to everyone's ideas and opinions. I'm stopping by to return the follow from bloggy moms. Thanks for sharing your thoughts on this. I have been very interested on what people think about this situation. By the way, I am a new follower of your blog. Hi! Thanks for the comment on Bloggy Moms and for turning me onto your site! I'd love it if you'd check my blog out when you get the chance- I LOVE feedback. I look forward to following you and reading more! I found you through Bloggy Moms. Following. Wow, this is a very thought proking post, in the sense that in the coming years I will have a child old enough to ask these types of questions. Great article. Thanks for the follow, and I have subscribed to your blog as well. Keep up the good work! As someone else who enjoys your blog, I'm also giving you an award. It's on my blog today, with your name on it!